I found a copy of this recipe in the cupboard “filed” under “Recipes I’ve Been Meaning to Try for Years but Haven’t Gotten Around To”. This file consists of a pile of recipes that have been copied, ripped out of magazines and quickly written on restaurant napkins. It’s very well-organized (riiiiiight). I deciphered that Carolyn picked this one up from our vegetarian friend, Kathy. None of us knows where it came from, but we can all vouch for its deliciousness. When you use this much butter and heavy cream in any recipe, it can’t be bad, except maybe for your arteries. I’ll indulge in this again sometime when I’m having guests so that I don’t end up eating half of it, myself. In the mean time, I’m not complaining. To make the crust: Combine flour, sugar and salt in a medium bowl. Cut butter into thin slices and work it into flour with the tips of your fingers until thoroughly incorporated and mixture resembles coarse crumbs. Sprinkle with ice water and toss dough with a fork until it clings together. With your hands, pull dough together into a ball. Press dough into a 9-inch tart pan with a removable bottom. Crust should be thin across the bottom and around rim. Trim off excess dough. Prick bottom all over with a fork. Freeze for 30 minutes. While crust chills, preheat oven on 375. Bring a large pot of salted water to a rolling boil. Snap woody stems off asparagus and discard. Wash spears, place in boiling water, and blanch until bright green and just tender, 2-3 minutes. Drain well and cool under cold running water. Drain and pat dry. Choose 12 best-looking spears. Cut off 3 inches of tops and reserve. Slice the remaining spears crosswise into pieces half an inch thick and set aside. Bake chilled crust in lower third of oven for 20-25 minutes, until lightly browned. Cool on a rack for 10 minutes. Beat eggs in a medium bowl, then add cream and cayenne and beat again. Stir in sliced asparagus and cheese. Season with salt. Pour filling into crust. Arrange reserved asparagus tops in a spoke pattern around center. Bake 25-30 minutes until top is lightly browned and a sharp knife inserted near center comes out clean. Cool slightly before cutting and serving. That looks stunning and delicious! looks fabulous! a great hearty way to start a cool day. This looks FANTASTIC. I am a HUGE HUGE fan of Asparagus and this looks like a spectacular tart!! this is beautiful just bought a new fluted pan, and this looks like what needs to go into it! thanks for this recipe love it! Fabulous tart! Asparagus is so good and you know something, I could take a bite of that photo right now! This looks great! I am going to make it to bring to a brunch this weekend. Thanks! Asparagus always reminds me of spring. 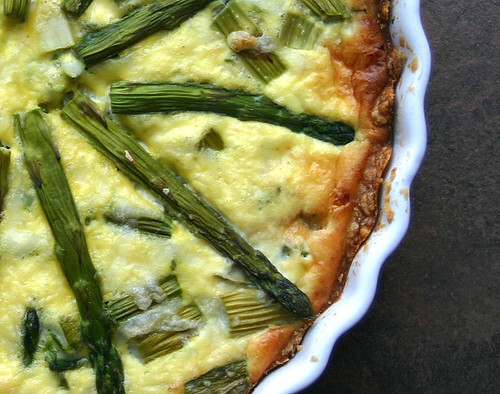 This is a great dish…the Gruyere would be so delicious with the asparagus. Wow. You can’t go wrong when using asparagus and that looks so rich and wonderful! My mouth is watering – this looks and soooo good! Looking forward to makin’ it too! Oh man, soooo good! I love your photo too. Call it tart or quiche……anything with buttery crust and eggy filling, that’s my kind of food! I bet this is even good cold..what a lovely tart! Perfect for a holiday brunch. Nice photo and post. your pictures are always so fabulous….that kind of camera do you use….I saw this on foodgawker…I know they are the hardest to get approved…and your pictures always do, amazing realization that you capture….would love to know what kind of lens you have…are you a professional photographer? I use a Canon DS 6041. They don’t make it anymore. I believe that my sister, Mary (who takes most of the photos on this site) uses a similar camera that she purchased from eBay. It’s worked out swell for me . I also use photoshop to edit. Haha! I have one of those stashes of “recipes to try too”! Although my collections has grown from magazine/newspaper printed recipes to several blog recipe posts – this one included!